This was a worrisome change from priorities I’d always followed. Yet, in another way, it wasn’t: I’d been taught to value speaking with integrity. In recent years, especially, I’d wanted to be clearer in my own mind that what I was teaching was reflective of what seemed to matter most to Jesus. For it wasn’t hard to see in history that religious dogmatism had trumped Jesus’ example time and again, and with sometimes horrible results. I decided to walk through the Jesus stories and talk about what he talked about. And if I did it with integrity, what he talked about most would be what I talked about most. I ended up at this nexus of Jesus and poor people. In fact, stunned by it, I asked my church one Sunday morning to tally up how many times it happened in Luke’s core chapters, 4-21. How many times would Jesus be caring for someone in poverty (widows) or isolation (lepers) or someone considered by the culture of the day to be of low prestige (women, children, foreigners), or hated (Samaritans and tax extortioners) or thought to be under God’s judgment (adulterers and people in disasters)? And how many times would he tenderly make such people the heroes of the stories he invented, scandalizing his audiences? 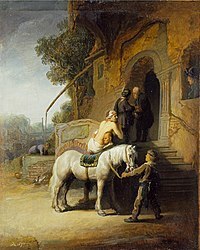 Telling of the “good” Samaritan would be like using a black man as a role model to Ku Klux Klan members during the Jim Crow South, or a Native American as an example of virtue in a 19th-century U.S. Cavalry outpost—or an immigrant without papers as an example of familial love before a modern anti-immigration convention. Between the two, we counted 27 events in 14 chapters! “If we wrote the history of our church in 14 chapters, would there be two stories of our caring for disenfranchised people in every chapter?” Hardly. And if I were to represent the teachings of Jesus with integrity . . . well, you see the point. If I take Jesus’ example – the least, first – and look at relationships, politics, foreign policy, race, economics, gender, culture . . . where do I end up, week after week? Your post makes me wonder to what extent christianity (your church, the american christian church/community, etc.) is about learning from and following the teachings of Jesus. If it is not happening much, is it because it is not really that important in the church? (or because the church is not that important in people’s lives?) If it was really important would not the church both measure and mange it better? You measure and manage your finances, your membership, the cleanliness and upkeep of your buildings. If you don’t measure how well your church as a body, and perhaps your members as individuals are living by/following Jesus’ teachings can you manage it? improve it? Of course measuring could be dangerous. Would a 20% adherence be acceptable? or would it destroy the institution. (like Jack Nicholson’s character in A Few Good Men ‘you can’t handle the truth’. I don’t believe that very many of us can handle the full truth about ourselves, and a minister who tried to get a congregation to face an unpleasant and not easily rectified “truth” might well pay dearly. I came to your blog through your 10 things the govt. does well post,and I’ll note that I did not notice any responder altering their view on the issue. Munaeem (and Malachi): Please forgive my long delay in answering your question. I have thought about it much, and have thought on the various answers I have heard to it. Everywhere I look, when I look closely, I seem to see God. What others see, I can’t tell. partial, and only deductions from things I think I know about God. Here’s the dilemma: on one hand, in my world, I believe I do perceive God’s presence. Into those worlds where my influence and understanding are so faint – the worlds of tyrants – I can’t see. I am convinced that it is my responsibility to do whatever I can to cause tyranny and horror to stop (and I view Mr. Bush’s acts upon Iraq as tyranny and horror). But as to why they persist, I am no expert. And while there is much that could be said, what I’m only willing to admit I know is that Presence. While the existence of horror is indeed perplexing and dreadful, and I despise it, yet I can’t say the presence of that perplexity changes what I see around me personally, which is indeed wonderful. I wish I could give a more satisfying answer. Perhaps some day I will be able to do so. If God is all over the place. Why does He not stop tyrants from committing horrible crimes ? Monte said: Thank you, Munaeem; it is an excellent and difficult question. Allow me some time to reflect, and I will respond. I was interested in reading your response to Munaeem, Monte. Was it on another post? Do you have a copy of your response? Thank you Monte for visiting my blog. You have an incredible site here. I couldn’t help but notice the comment above (from Munaeem) in which the person asks why God does not stop tyrants? In my opinion, the answer is simple: God created everything, including the tyrants. He just knows that regardless of what He does for them. they will continue on the path of tyranny. Yet, He is Merciful and awaits their “return” to the right path. This He knows that they would or wouldn’t but the creation (us) do not. So equally, we’re responsible and are required to help them find the straight path. As Moses did with the Pharaoh. And on Judgment Day, God will question those tyrants about their deeds. What He does with them then is up to Him. But we will also be asked if we extended a hand – for His sake – to help! And don’t forget, a day to us is not even a fraction of a fraction of a second if even that, to Him. So what we consider years, to Him they maybe less than a millisecond. Why am I saying this? I visited a blog (forgot which) but I did keep the link about the Glory and Majesty of God in a video that was probably created for fun. See this here… and after you watch it, just think how God hears our prayers – all of us – as if each of us is the only one praying to Him. Monte Says: ATW – thanks very much for your kind words and insightful comment! It focuses on providing resources for liturgy and spirituality. You would get an idea of the “flavour” of what it offers by visiting http://www.liturgy.co.nz/html/collect573b.html and http://www.liturgy.co.nz/html/collectlent2.html (commenting on your collect for next Sunday). I hope you will place a link from your site to mine and I provide HTML code for this in my next paragraph. If you place such a link, please would you let me know as I acknowledge this on my site and link back. Liturgy: Christian worship & spirituality – serving individuals and communities seeking to have worship and spirituality that is vital, transforming, and faithful. Just wanted to stop by and say Hello. Great blog! Love some of the posts I’ve read so far. hello, sorry for the delay…it’s been awhile since i came back on my blog….life’s been so busy lately and i find it so hard to catch up with all the work on the computer..i’ve been reading Isaiah every morning and not be able to spend all day writing posts…but thank you for stopping by and i will come visit often for sure…. but funny i saw “Bateman” on some movie too some years ago, thought somebody wrote that movie must have some relations with this family, but no….i don’t really wanna open this history door…lol…. yes i’ve been so close to God myself since i came to america and he’s given me so many blessings as every day goes by… but i am still growing up in a way that he sees me unique. Do you interest in exchanging links between blogs? If you interest then let me know. I will add your blog as a link to my blog and you can do the same. Nice blog. Have a very Merry Christmas. Monte: Please send me your e-mail address. I continue to be utterly amazed at your insights and at the vitality of your congregation. Yours is a blessed community. Thanks, Diana, you’re welcome here! Ahhh, so very right-on! Isn’t God the best? I wanted to leave a post here, to let those of you who have prayed with me about Elizabeth, know what’s up. She is finding joy and excitement and is really happy. I haven’t heard her voice like this in years!!! She wants people to know how much help is still needed in the area. The government help is dwindling and many areas look like the storm just hit. She told me that she is going to be staying there for quite awhile. She is plugged in and very involved. She hasn’t said that she is living for Jesus, but has asked me to pray…!!! God is so good, …..after years of praying, he is letting me in on the plan. I have always thought he was preparing her for quite a life, with all she’s been through….here we go!!! I feel a little silly about the discouragement and sadness I have experienced over the years. Kind of insulting to God…he is growing me all the time….. Paul says: “Don’t be anxious about anything” If only I could live it all the time.